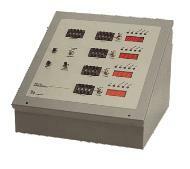 Badger's AC-151 admix control unit is designed for a single unit dispensing system or a direct feed type. Operation includes automatic and manual operation with special features such as indication for zero, fill, complete, discharge, and overfill. Accurately control up to 4 admixes using automatic or manual operation in a choice of three batch pre-set modes: total ounces, ounces per CWT, or ounces per yard. Capabilities include sequence discharging and line empty notification. The Model DP-10 Probe Amplifier has been designed to interface admixture systems into automated batching panels. Provides you with L.E.D. indicators when probes are covered. Can be used with single or dual probes with probe sensitivity adjustment.